I just love beautiful floral stickers, the 3-dimensional kind (like K & Co.'s). This bouquet and the little bee came from the same pack, and really help "make" the card. The embossed background is made with a Spellbinders Impressabilities plate, then lightly washed with white craft ink to help bring out the contrast of raised areas. This is short and sweet, so I can go check some more things off my To-Do list now. Thanks so much for coming by! Your card is an absolute treasure Colleen. Those flowers look so realistic, and I'm lovin' that lace and the embossed background. Oh this is so pretty, Colleen! Love the elegance of it! So beautiful! Your cards are always so gorgeous and elegant! This is gorgeous!! I love love love those flowers and the lace!! Wow, this is so beautiful, I love it. So gorgeous! I think your new crafty space is good for you. I LOVE all your floral stickers. This with your card design and the greens is especially lovely. So beautiful ! I loved the embossed bg,3D sticker,the lace n everything ! super pretty! love the stickers! Wow, Colleen, das ist eine unglaublich elegante Karte. Man glaubt, die Blumen sind echt. Ist die Biene ein Aufkleber? Die sieht einfach toll aus. Such elegance, my dear! 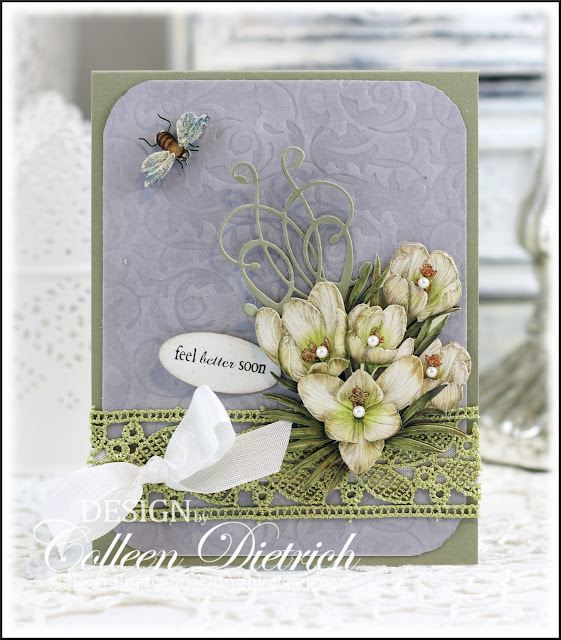 LOVE the color of that embossed panel, and your blossoms add such dimension! This is pretty! I love the cute bee! What a beautiful card my friend. I just love the K&Co cut outs. They sure do make life easy..
Ooh, beautiful! I love the stickers, lace, and bee. The background looks super, too. LOVE the embossed background with that flourish! LOVE the flowers and that green lace, too! FAB card, Colleen! 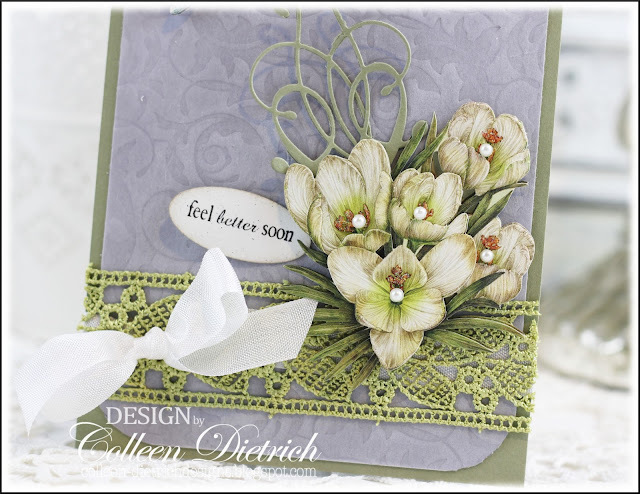 Colleen, what an amazing card, it is seriously gorgeous!!! Those flowers look amazing. These are pretty stickers but your color choice, layout and texture make the card beautiful! Come Tour My Crafting Studio!